Playstyle: Highly mobile character with a decent pressure game. -Great mobility whether in the air or on the ground. -Some of his normals reach pretty far. -Has several ways of getting around projectiles and even has his own ground and air projectile. -Has a few moves that can let him dodge certain attacks. -Damage output is a bit on the weak side. -Has a hard time escaping corners, needs meter for reversals. -Outside of his air throw, without meter his anti-airs options are questionable. Air Throw (Hold Forward/Backward + Select, air only) - Basically says it right in the name, Ryu grabs the opponent and throws them downwards. 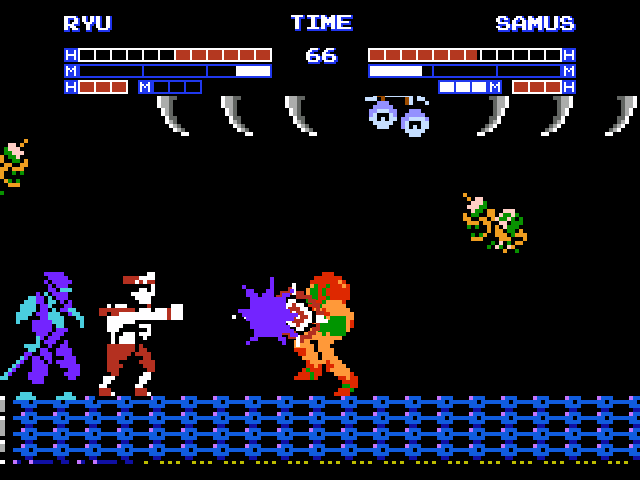 Jump and Slash (D, DB, B, Punch or Kick; can be done in the air) - Ryu jumps and spins through the air with his sword. The button you press determines the arc. The punch is a low but far arc and the kick is a high but short arc. The punch version is good as a combo ender and can hop over low attacks. The kick version can be used as an anti-air although the lack of invincibility on it means it can be interrupted. Climb up and down on the wall. Toss a shuriken from the wall by pressing Punch. Hop off the wall by pressing Kick. If you hold any direction while pressing kick, you can change the trajectory of his jump. (Holding back would keep him close to the wall, holding down would just have him drop, holding up makes him do a higher jump and holding forwards would make him jump farther. Diagonal directions can also affect the jump too) You can still do any air moves during this jump. Windmill Shuriken (D, DF, F, Punch+Kick; can be done in the air) - Ryu tosses out a windmill shuriken. Can go through special projectiles and hit twice (once forwards, once backwards) but doesn't travel as far as the normal shuriken due to its boomerang properties. In the air, it can work as a far air-to-air. EX Jump And Slash (D, DB ,B, Punch+Kick; can be done in the air) - Ryu preforms the kick version which has strike invincibility in the beginning and knocks down. Holding forward before he jumps makes him preform the punch version but with projectile invincibility instead. EX Wall Cling (F, DF, D, DB, B, Punch+Kick or B, DB, D, DF, F, Punch+Kick) - Both versions grant Ryu a small window of invincibility as he approaches the wall. Follow-ups don't change. Windmill Shuriken (Wall Cling version) (Select+Punch) - Basically lets Ryu toss out a windmill shuriken while hanging onto the wall. Still has the same properties as the original version. Fire Wheel (Level 1) (D, DB, B, DB, D, DF, DF, Punch) - Ryu throws out a fire wheel that goes up-forwards and hits three times. Ryu has invincibility during the start-up which makes this an effective anti-air super. Somewhat difficult to combo into. Dragon Breath (Level 1) (D, DF, F, D, DF, DF, Punch; Air only) - Ryu throws out 3 fire dragon balls traveling at different trajectories. They do more damage than the normal fire dragon balls and knock down on hit. However, this move only does major damage if the opponent was near Ryu's palm (since all 3 would hit). Furious Blade (Level 1) (D, DF, F, DF, D, DB, B, Punch) - Ryu preforms a series of slashes and if the last one knocks the opponent into the air, he gets under them and unleashes a Vacuum Wave that hits the opponent. The sword swings themselves can also hit projectiles although it's not a strong answer for them. Soul Splitter (Level 3) (D, DF, F, D, DF, DF, Punch + Kick) - Ryu takes out his sword and dashes forward, slashing through the opponent. 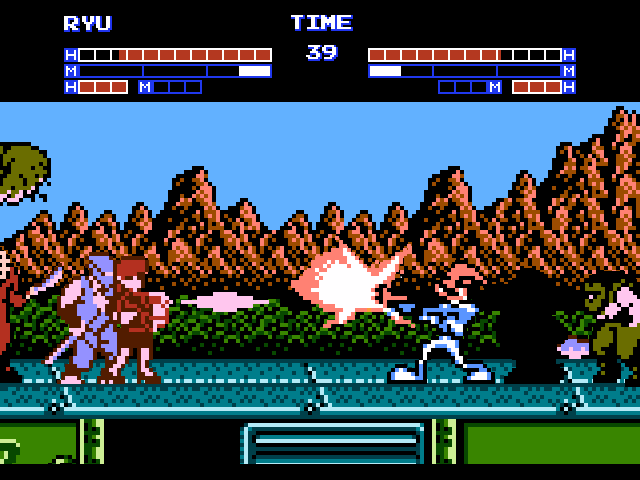 On a successful hit, the screen blacks out with two other body split Ryu's appearing, attacking the enemy with Ryu delivering the final slash. Ryu has invincibility during the dash but the recovery is quite long on block/whiff. Awesome and the third helper how about jaquio or the ninja clone? 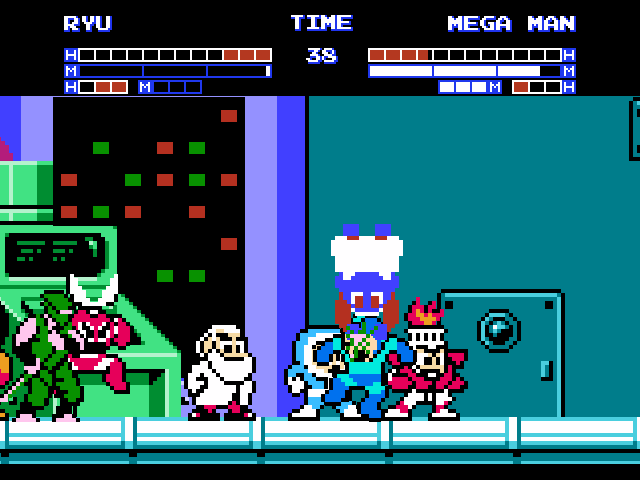 Third striker should be one of the wrestlers from Tecmo World Wrestling. @AntonioQuirino: Looking for characters from other games (but same publisher) so no. @Magma Dragoon MK II: Actually, I might look into those. Thanks for the idea! Time to give back to this place. Starting now. How about the Sumo from Tsuppari Ōzumō? Could be useful for something. Or even more awesome make a football player from the Tecmo Bowl series as a striker. I hate to brag about moves but isn't wall cling OP? I mean you can just hang up the wall when your opponent can't get you. So you should set a restraint on how long you can be on the wall for before you fall back to the ground. @R565: Those could also work as well. I'll think about it. Actually, there is a bit of a height restraint on how high you climb up (the restraint is like, a little below the lifebar background) and right now, everyone has a way of smacking Ryu off the wall. A time restraint wouldn't hurt though. hey some helpers come in my mind: Valkyrie(Macross), the bump'n'jump car, the soldier from front line or tamagon from devil world.